The Tenth Annual Marco Manuscript Workshop will be held Friday and Saturday, Feb. 6-7, at the University of Tennessee in Knoxville. This year’s workshop is organized by Professor Thomas Burman (History) and Ph.D. candidates Scott Bevill and Teresa Hooper (English). William Sherman closed his 2008 Used Books with the following question: “Are books from the past precious relics, in which marginalia are dirt or desecration, or are they inanimate objects (like pots or arrowheads) that are only brought to life by traces of the human hands and minds that used them?” This year’s workshop seeks to address this question by highlighting not only studies of marginalia but also erasures, lacunae, palimpsests, and the transformative processes of rebinding and repurposing. After fires, water, rats, cats, early modern editors, contemporary censors, later bookbinders, and other disasters have damaged manuscripts, we nevertheless discover that we can learn much from what is missing from or added to a manuscript. The life of these books may be found not only through the text written on the page, but also scribbled in the margins, erased between the lines, pasted within the bindings, glossed on the endpapers, or folded into the quires. What do we see when we look in the gaps? How can we develop new ways to explore the rich textual interplay of imperfect manuscripts? What meaning and value can we recover from cases of dirt and desecration? We welcome proposals on any aspect of this topic, broadly imagined, from late antiquity to the boundary of the modern era. 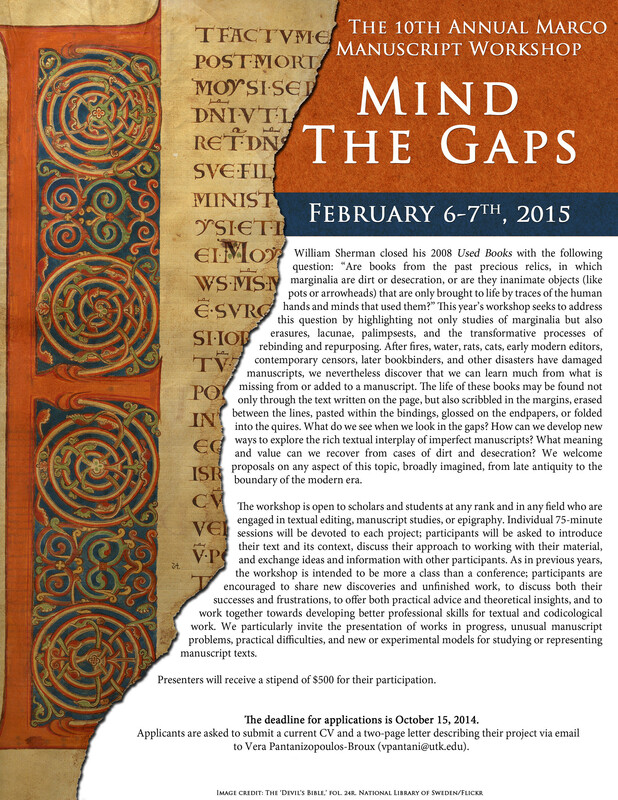 The workshop is open to scholars and students at any rank and in any field who are engaged in textual editing, manuscript studies, or epigraphy. Individual 75-minute sessions will be devoted to each project; participants will be asked to introduce their text and its context, discuss their approach to working with their material, and exchange ideas and information with other participants. As in previous years, the workshop is intended to be more a class than a conference; participants are encouraged to share new discoveries and unfinished work, to discuss both their successes and frustrations, to offer both practical advice and theoretical insights, and to work together towards developing better professional skills for textual and codicological work. We particularly invite the presentation of works in progress, unusual manuscript problems, practical difficulties, and new or experimental models for studying or representing manuscript texts. Presenters will receive a stipend of $500 for their participation. The deadline for applications is October 15, 2014. Applicants are asked to submit a current CV and a two-page letter describing their project via email to Vera Pantanizopoulos-Broux (vpantani@utk.edu). The workshop is also open at no cost to scholars and students who do not wish to present their own work but are interested in sharing a lively weekend of discussion and ideas about manuscript studies. Further details will be available later in the year; please contact Vera for more information. R. Scott Bevill (English) is a PhD candidate in Anglo-Saxon and early modern literature. His research interests include paleography, antiquarianism, the Anglo-Saxon classroom, and medievalisms. His current research involves the wider implications of the 16th century antiquarian mood on early modern historiography, poetics, and politics.